.Quiltscapes. : Top 5 Tips for Sewing with Laminates! 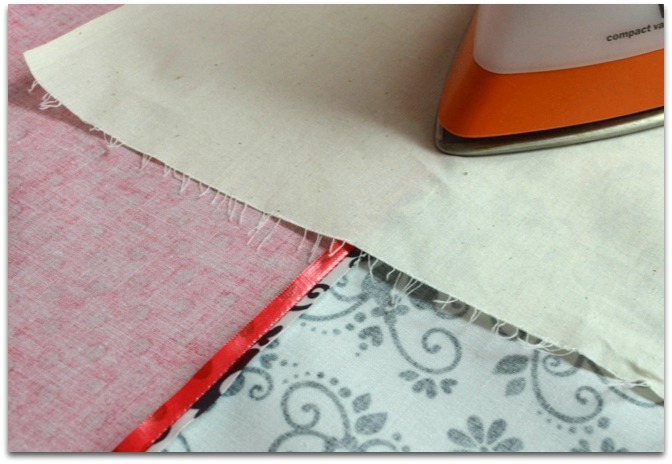 Top 5 Tips for Sewing with Laminates! You've seen it in the quilt shops, made into darling bags, rain coats, aprons... cute prints that coordinate perfectly with that line of designer cottons. You may even have a stash of it sitting on the shelf, waiting for the perfect project! It's laminated cotton fabric ( cotton laminate, or "laminate" for short), and you may be just a tiny bit afraid of it! Don't fear the fabric! It is regular cotton fabric with a thin vinyl coating. It's soft, supple, great for crafts and easy to sew with just a few tricks. Here are my TOP 5 TIPS for sewing with laminates. 1) YES, You can PIN laminate! Use fine pins like these glasshead patchwork pins for best results. You can reduce pin holes by spritzing the back lightly with water, then press on the cotton side. If you prefer not to use pins, try paper clips, or binding clips. Or you could use a glue stick or maybe double-stick fabric tape (works perfect for zipper installation!) as an alternate method of holding your fabric in place while you stitch. 2) YES, You can PRESS laminate! 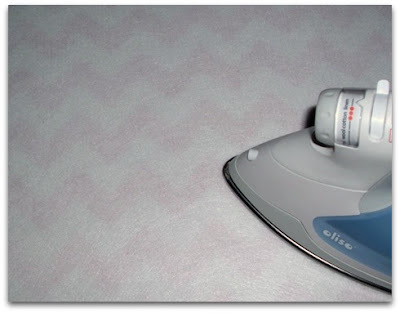 Use a slightly cooler-than-normal iron, press from the back, or use a press cloth (a square of muslin works well) when pressing on the laminated side. You can use a little spritz of water or a bit of steam. Just don't overdo or you will dull the laminate coating. 3) YES, You can FUSE laminate! Fusible products can be adhered to the wrong side of the laminate. Follow manufacturer's directions and press for about 7 seconds at each spot, overlapping the iron and using a little steam. 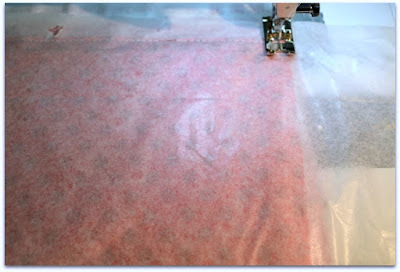 Be careful not to over-press as it can reduce the adhesive properties of your fusible product. I use Pellon 987F fusible fleece to make my UFO-to-Go portable design walls and my Pack-Along Picnic Quilt. 4) YES, You can SEW laminate! 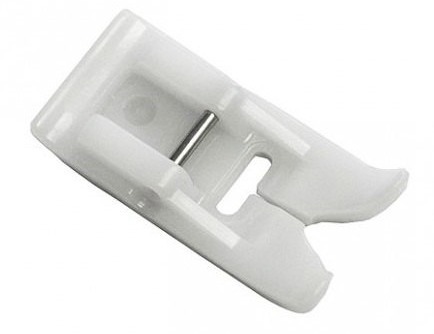 Many sewing machines offer a Teflon foot for use with vinyl and laminates, which helps the foot glide over the laminate without pulling. Depending on the machine, the price can range from 45 cents to 99 dollars! If you don't have a teflon foot, try putting some removable painter's tape over the bottom of the foot. That has worked well for me. Use a pin to poke a hole where the needle goes. Another option is to lay a sheet of paper tissue over the top and stitch through the tissue. Tear off the tissue when the seam is complete. Here's another option - rub a tiny dot of machine oil on the bottom of the regular presser foot. Then just wipe off the laminate when it's stitched. Use a new, sharp needle in the sewing machine. Set stitch length between 2.5 and 3.0. Try not to "re-sew" too many times. Polyester or cotton-poly thread seems to have less breakage than 100% cotton thread. If you are having trouble feeding the laminate through the machine or if it's sticking on the sewing machine bed, here are a couple more ideas: 1) Lift the fabric off the machine bed slightly so it comes in contact with the machine only at the feed dogs/presser foot. That has worked well for me. 2) Try sprinkling a little corn starch or baby powder on your hands, then wipe your hands over the sewing machine bed to reduce the "stickiness". 5) YES, you can CLEAN laminate! The laminate coating will wipe clean with a damp rag. You can also hand-wash and air dry. Best not to throw it in the dryer as the heat may dull/diminish the vinyl coating. All great hints. I never thought of fusing on laminate.